I have basically had enough of politics. Not politics in the everyday sense: local concerns and community organisations as such. I mean big politics. No no – not interesting, big politics: ideas, treaties, revolutions, and so on. I mean TV politics. Slogan politics. Dead-eyed people on TV reassuring the country about the economy or a parliamentary aide caught in a texting scandal. Rubbish politics. There was too much of it last year, this year, and when things really began mattering, such as in Charlottesville, in Myanmar, off the coast of Australia – big TV politics did what it always does; it smiled, and said it would keep the economy strong. As much as I dislike it, there’s one more election of global consequence coming up. This is the election in Germany. While it would have been disheartening and disturbing to see the Netherlands and Austria go full-Nazi, they wouldn’t have necessarily created an actual power shift in Europe. If France, however, decided to invite fascism back into power, then the entire European project may have been under threat. The same is true for Germany. France went for Macron – he still has time to turn that around, by the way. This coming Sunday, Germany will vote in its general election, and the far-right Alternative, Fuer Deutschland (AfD), are set to take at least 11% of votes, mostly concentrated in the country’s East. Its popularity in Dresden, Leipzig and other Eastern cities has been noted, with followers wielding flaming torches and shouting about their way of life, which, amazingly, doesn’t actually seem to include holding flaming torches. The dissatisfaction with the ‚lying elites‘ of Germany runs so deep that 11% of the country’s population is willing to vote for an overtly nationalistic, racist and ethnocentrist party. A far-right majority vote would not only go against everything Germany has worked to achieve since the ending of the war, it will also undermine the European project, given that AfD’s raison d’etre is to ensure no more German money goes to failing European economies. It would be tremendously dangerous for Germany to engage in this programme of re-Nazification. And it would also be deeply ironic if the AfD made its way into power just when the EU’s economy, including Spain and Greece, is starting to look healthy once again. German voters cannot pretend they do not know what they’re voting for, or that the AfD is ’simply‘ a protest vote. It is a vote for outright racism. It is a vote for nationalism. It is a vote to reverse the cold, honest reflection Germans have lived by for decades since the war. Hey, with Trump and Brexit behind us – 11% might just be the least of our worries. 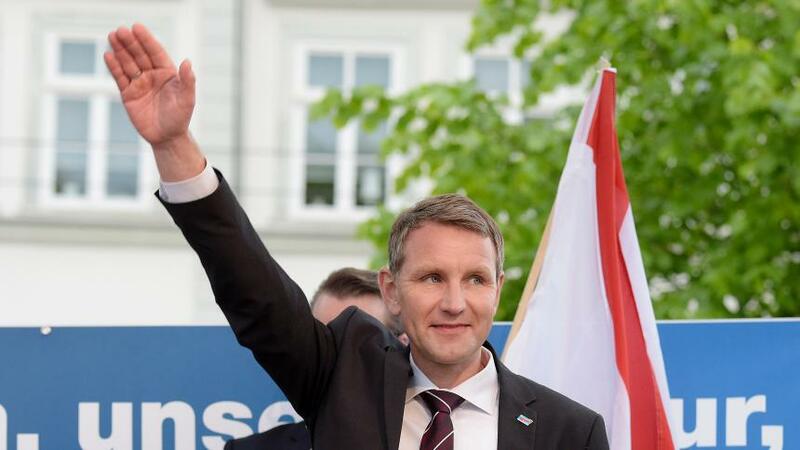 Image: Bjorn Hocke, AfD figure, waves, or salutes. L’Oréal's sacked trans model Munroe Bergdorf. An act of racism? Munroe is fighting back. What happens in Brazil right now is called “the biggest attack on the Amazon in the last 50 years”! That must be stopped! Millions of innocent girls - especially in Africa - have had to bear humiliation their menses.